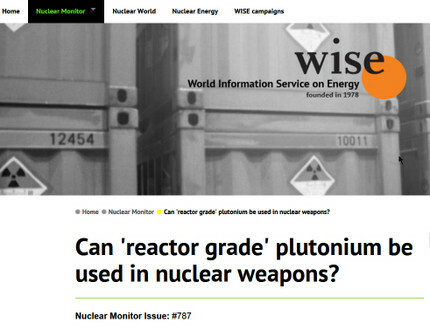 〔★は大沼〕 ◎　Nuclear Monitor Issue: #787　Can 'reactor grade' plutonium be used in nuclear weapons? ・　* Production of plutonium in power or research reactors followed by separation of plutonium from irradiated material in reprocessing facilities (or smaller facilities, sometimes called hot cells). ・　* Production of radionuclides other than plutonium for use in weapons, e.g. tritium, which is used to initiate or boost nuclear weapons. ・　* Diversion of fresh highly enriched uranium (HEU) research reactor fuel or extraction of HEU from spent fuel.